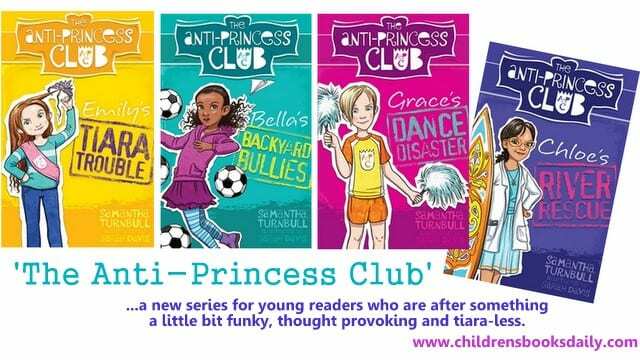 ‘The Anti-Princess Club’ series is aimed squarely at young female readers who are after something a little bit funky, thought provoking and tiara-less. The book trailer says it all. To add the APC books to your home, school or library collection click on title or book cover image links. I’m always on the lookout for books which challenge the status quo and make young readers’ think deeply and question freely. Book publishing of course has to be profitable, so taking a risk on a first time author or a new concept is done with caution – and I get all excited when I see something a little different or a creator I’ve not yet come across. 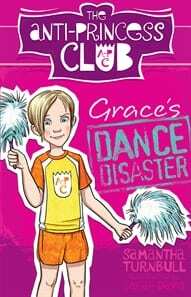 So it was with ‘The Anti-Princess Club’ series, published by Allen and Unwin, written by Samantha Turnbull and illustrated by the ridiculously prolific and talented Sarah Davis – who seems to be able to change her illustration style as effortlessly as we mere mortals change our socks. You can read more about Sarah Davis in my ‘Book People’ post on her here. Samantha Turnbull is a multi-award winning journalist based in Byron Bay and working at the Australian Broadcasting Corporation. 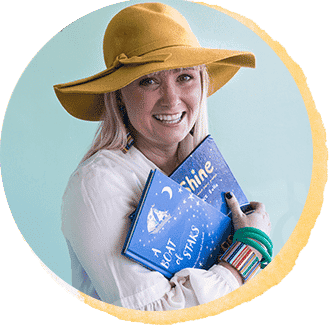 Her writing has been featured in publications including ABC online, the Canberra Times, Daily Telegraph, Northern Star, SHE magazine, Cosmopolitan and the Walkley magazine. Samantha doesn’t like stories about damsels in distress. She likes to read and write about girls who don’t need rescuing. You can read more about Samantha in my ‘Book People’ interview here. 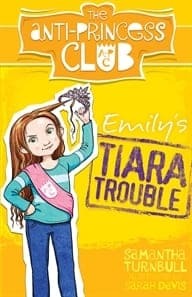 The first ‘Anti-Princess Club’ book (below) has been a huge hit with PudStar. We read it together and have had so many great discussions about ‘to make-up or not to make-up’, what ‘pretty’ is, friendships, ‘clubs’ I was in as a child (our ‘Nature Club’ was a dismal failure huh Amber, Zoe and Ing!) and the joy of baking baklava – I do so like a book with food. 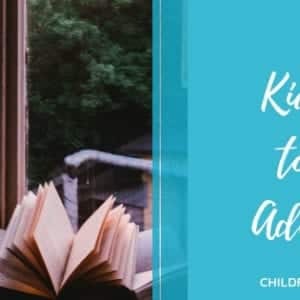 There is a great website here, which accompanies the series and provides printable colouring sheets and Teachers’ Notes. The five books in the series are below. Click on cover images to purchase. 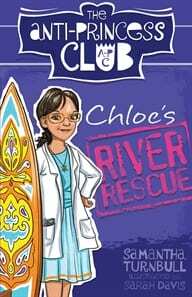 When maths whiz Emily Martin’s mother enters her in the local beauty pageant, it’s the last straw – the four friends form the Anti-Princess Club, with the motto WE DON’T NEED RESCUING. Can they use their awesome skills to show that girls want to be valued for more than what they see in the mirror? Design genius Bella Singh has built a clubhouse in her backyard, where the anti-princesses meet to thumb their noses at the notion that boys are best. But when they receive angry anonymous emails telling them to act like girls or else, followed by sabotage of their beloved clubhouse, it’s clear they have a new mission. Can they unite their awesome talents to beat the bullies? 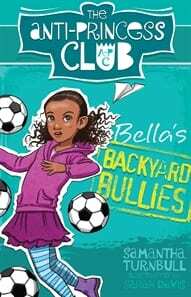 Sports-mad Grace Bennett is ecstatic when her teacher arranges a training session for her with a famous football team. When Grace arrives on the field, however, her role is not what she expected – and it certainly doesn’t involve kicking a ball! How can she and her anti-princess sidekicks teach their teachers that there’s more than one way to be a girl? Science star Chloe Karalis’s favourite person in the universe is her grandmother – so she’s thrilled when Yiayia comes along for a fab summer holiday with Chloe and her three besties. But when Yiayia goes missing on her daily walk, the foursome know that they’re faced with their biggest mission yet. Can they combine their unique talents to rescue their beloved mentor? Maths whiz Emily Martin has won a place in a video game competition – on a summer cruise! And her best friends Bella, Grace and Chloe are with her all the way. 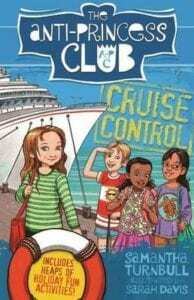 While onboard, the girls set themselves a few anti-princess missions: win the regatta, rescue the endangered turtle, show the gift shop manager that dolls can be more than be pretty, and prove to the gamers that girls can compete – and win! Can the anti-princesses work together to complete their missions, and maybe pick up some new members along the way? Looks so great! I can’t wait to read these books. Samantha is so talented. Love the website too! I am so glad I found your website! I can’t wait to see what my daughter thinks of these books! I’m so pleased! Welcome to my online world of nattering on about books I adore!